Poet Knotbrook Taylor has always been interested in lighthouses. In 2008 he met Virginia Mayes-Wright, the Director of the Museum of Scottish Lighthouses and became the Lighthouse's Writer in Residence. 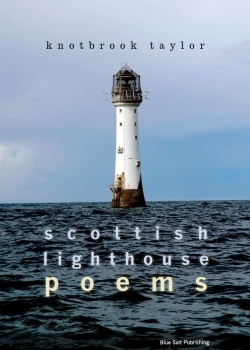 Two years later, and a second residency produced a stunning volume of Scottish lighthouse poetry evoking the powerful beauty of lighthouses, the ingenuity of their builders and the sturdy resiliance of the keepers who manned them. Lighthouses have always evoked strong emotions in people. This volume will chime with everyone's imagined lighthouse. Special guest at the launch event, part of New Words 2010, was one of Scotland's leading poets, John Glenday, who has said about Knotbrook's new work: This astonishing collection of poems, found poems and fragments does what all good poetry should do: it engages, enlightens and entertains us. But its true significance comes from the wonderful insight it grants us into a profession that has virtually ceased to exist. In this respect it is welcome both as a literary achievement and a historical account. Taylor's skill lies in how deftly and lyrically he combines the two for the benefit of both. 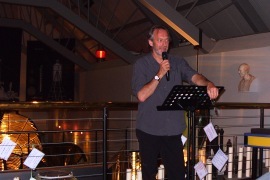 On 4 September 2010, I made my way to the Fraserburgh Lighthouse Museum for the launch of Knotbrook Taylor's (the Lighthouse's Writer in Residence) new collection, billed as "the world's only dedicated collection of Scottish Lighthouse poetry". I had high hopes: let's face it, who doesn't like lighthouses? 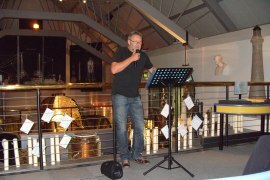 Also reading was renowned poet John Glenday, whose work has been shortlisted for a number of prestigious awards for good reason. And if that wasn't enough to lure me in, there was the added promise of coffee and cake. Knotbrook gave his usual impressive performance. The poems he selected from his attractively-covered collection were varied: the memory of a great day spent on the water with friends during a visit to the Bell Rock lighthouse ("the strange and beautiful show"), a poem about a piece of tragic history ("it is supposed another ship has perished"). There was humour: lighthouse no's listed some peculiar rules pertaining to lighthouses, plus, I suspect, a few additional rules thrown in by Knotbrook for good rhyme. There was, of course, a versus poem, one of a series in Knotbrook's repertoire: lighthouse v love, and I was particularly fascinated by inventory, a poem listing items which a lighthouse might contain, from a real-life list that was found. John, whose soothing, quiet voice I could listen to all day, found a reference to a lighthouse in one of his own poems, and then nicely deviated to the linked theme of the sea. My favourite was his poem about the creatures of the deep sea, The Ugly. He treated us to the uncomfortable but haunting title poem from his collection, Grain, and the beautifully written The Kelp Eaters, taken from a real account in a journal dated 1741–42, about a friendly sea creature brutally harpooned for food. Two very different voices, two very different styles, but they complemented each other, and the event was an aural treat. Knotbrook Taylor is "hooked on lighthouses". 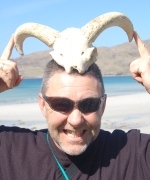 He has been writing poetry for fifteen years, beginning with performance poetry at the Edinburgh Fringe in 1993. Thirsting for more seriousness he began writing. Knotbrook won the Ottakars and Faber Fifth Annual Poetry Prize for Aberdeen in 2001. His first published collection of poetry, Beatitudes, was launched in 2007 by Blue Salt Publishing. Since then collaboration with the Museum of Scottish Lighthouses has seen a series of literacy sessions for school children, teaching them about poetry. Knotbrook also takes part in multi-media performance including dance, music and images with the Blue Salt Collective.